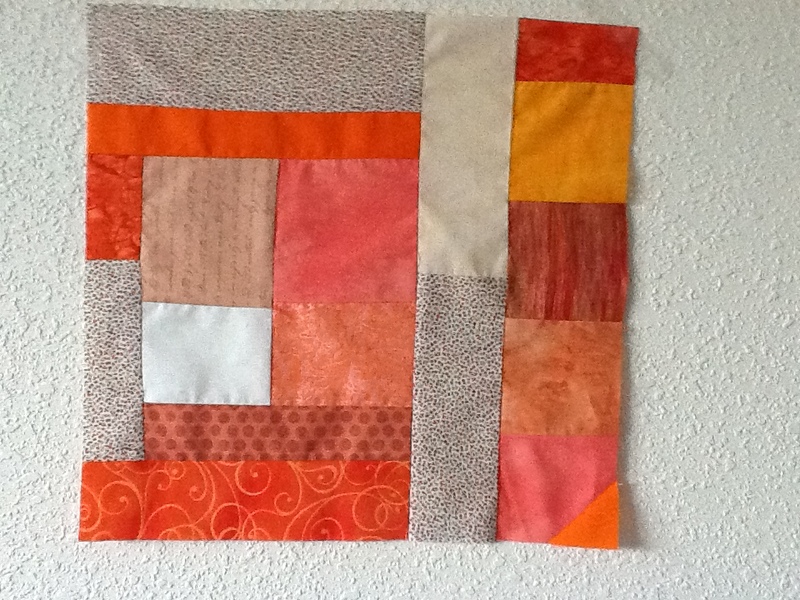 for instructions for making and sending slabs and a photo proving what great quilts we’ll be able to make! The photo shows my first slab. It didn’t take long to whip up and I was able to use some of the scraps from the box labeled “funny size squares.” Hmm, does Cheryl have a hidden camera in here or what? There’s a story behind the little triangle in the bottom right-hand corner. Promise not to tell the Quilt Police but after everything was sewn together and squared off at 15-1/2 inches I discovered a tiny hole in the corner of the hand-dyed fabric. So I took a piece of the solid orange and snowballed it on. If you can make a slab or three, please do, AND please spread the word! Cheryl posted on Tuesday but the CQA just publicized her initiative this morning. But this is the first time I’ve confined myself to just one colour. Just checked the pile of pre-made larger blocks but the colours are all jumbled up exactly like the earlier pieces I’ve made, so the next slabs will have to be made from scratch.